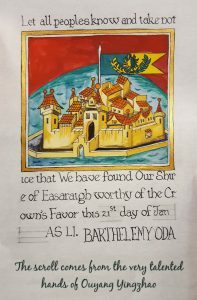 At Menhir yesterday (1/21/2017), The Shire of Easaraigh recieved the Order of the Crown’s Favor from HRMs Barthelemy and Oda. There shall exist within the Kingdom of Meridies an award presented to groups within the Kingdom, be they Barony, Shire, Canton, or Household, for service to the Kingdom, either directly or by way of serving as worthy examples of the type of behavior most favorable in these Current Middle Ages. The Award shall be called (upon approval of the Laurel Sovereign of Arms) the Award of the Crown’s Favor. This award is given at the pleasure of the Crown, and may be given more than once. Those receiving the award shall be entitled to attach to their group insignia/device/arms, a small pennon bearing a sable pale on an argent field, and carrying a single argent mullet. Upon receiving additional recognition through this award, additional mullets may be added (to a maximum of five), after which, having received the award six times, the first mullet shall change to Or, and so on in a like manner to a maximum of all five mullets. This award is non-armigerous and shall carry no precedence. This award is reserved only for groups (as defined in II-233,A) and shall not be given to individuals. So it begins…again..New Year 2019!